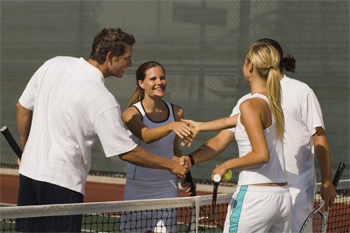 At Hidden Creek Country Club, Tennis Members can play every day of the year. Reserve one of our excellent new outdoor courts during the day or under the lights on cool evenings. When it’s raining or too hot or cold, play on Reston’s only indoor courts. After a good game, enjoy well-appointed locker rooms, work out in our fitness and training center with extended hours, or swim laps in the refreshing pool. Relax with friends, family and colleagues in our beautiful Clubhouse or on the popular Tavern Deck while enjoying great food and spectacular views. 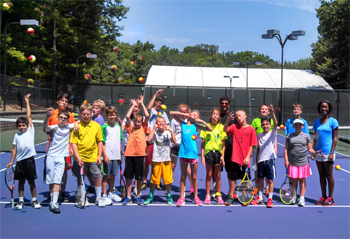 In addition to outstanding facilities, Hidden Creek offers USPTR programs and instruction led by well-known and highly regarded Director of Tennis John Kratzke. For over 20 years, John has worked with the most successful tennis professionals in the region and his background in biomechanics and sports physiology is vital to many of his students. John has taught 4 year-olds to 84 year-olds to enjoy the sport and spend more time on the court. John competed in junior national tournaments, college varsity tennis, and continues to compete as a USTA 5.0 level player and a nationally-ranked 35 years of age and over singles and doubles competitor.